Soon afterwards, six Hunters were reported to be approaching Sargodha at low level. 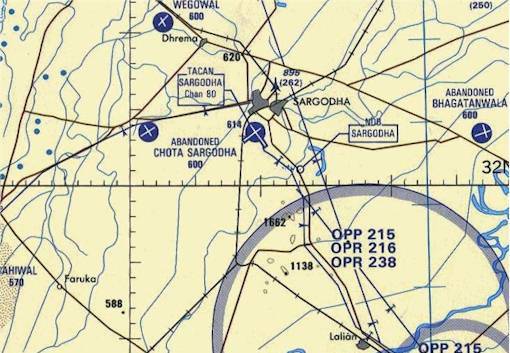 Four F-86s and one F-104 were already airborne, having been scrambled on CAP after the first attack; with the Starfighter providing top cover, the Sabres intercepted the Hunters as they were running in towards Sargodha. The Sabre leader, Sqn. Ldr. M.M. Alam, and his No.2, Flg. Off. M. Akbar, pursued the Hunters across the airfield and closed on the rearmost pair as the turned eastward. Alam fired two Sidewinders at them; one of the missiles fell away harmlessly, but the other appeared to have damaged the second low-flying Hunter, whose pilot pulled up and ejected. With the other Sabre pair orbiting some distance away to the south-west, Alam and his wingman continued their pursuit of the remaining Hunters, catching up with them just beyond the Chenab River. Seeing the threat, the Indian pilot broke left in line astern, putting the Sabres in an excellent position to turn in behind them. What followed was one of the most remarkable achievements in the history of air combat. In less than 30 seconds, firing in short bursts while pulling up to 5g in the turn, Sqn. Ldr. Alam destroyed four Hunters. At close range, the combination of the Sabre's A-4 radar ranging gunsight and battery of six 0.50 inch machine guns proved very effective. One burst punctured a Hunter's fuel tanks and the second ignited the escaping kerosene, and that was that. Only one Hunter escaped. As on the previous day, Alam - a highly experienced pilot with about 1,400 hours on the type - had exploited the Sabre's low-speed turning qualities to the full. The Hunter pilots, instead of breaking in opposite directions and drawing the Sabres to higher altitude, had tried to match their attacker's manoeuvrability, and had paid for their mistake with their lives. History has never been a particularly interesting subject for me, but on 7th September, 1965, I had the unique opportunity of seeing history being made. I shall not hesitate to accept that, ever since, my prejudices against history have weakened quite a bit. The tension of the post Rann-of-Kutch period had increased progressively culminating in the outbreak of the Indo-Pak War. The PAF was in a high state of alert. I was then at Sargodha - the focal point of interest for the Indian Air Force. It did not take a psychologist to analyse the state of mind of the PAF pilots. Calm and resolute, quite yet zealous, they were all too keen to their teach adversaries a lesson. Seated in the cockpit of an F-104 aircraft, I was awaiting my turn to the launched into the air. On a warning of an approaching low-level raid, some of my colleagues had already got airborne. For a short span of about half a minute we were anxious, but it was not long before we realised that the enemy had failed to deliver a proper attack and had caused no damage except to chip off a corner of a transistor-radio. They had to pay a rather heavy toll for the damage they had caused on the personal property of an officer - 4 out of the 6 raiding aircraft were shot down. When a second in-coming raid was detected, four of my colleagues flying the F-80s and I in my F-104 were ordered to the air. In minutes we were airborne and were waiting to "great-our friends." 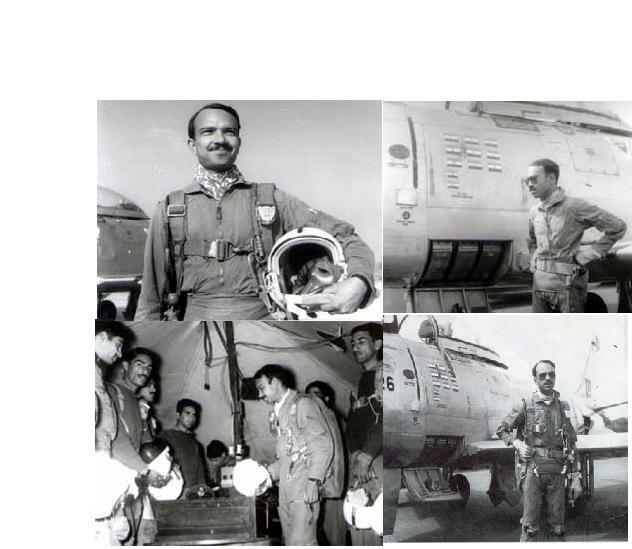 Squadron Leader M. M. Alam with his wingman was orbiting south-east of the airfield; the other pair of F-86s led by Flight Lieutenant Bhatti was further east of Squadron Leader M. M. Alam's section and I was circling the airfield at a height of about 15,000 feet. While heading north, I spotted four enemy aircraft exiting in a south-easterly direction. I called out on the radio that I had visual contact with them and started turning in the direction of the enemy's exist. By the time I had come behind the enemy aircraft, I saw that four F-86s - two of Alam's formation and two of Bhatti's - were already chasing the Indian Hunter aircraft. The Hunter is a faster aircraft than the Sabre: In order to close in to a firing range the Sabres had to jettison their external fuel tanks and dive down from height. Bhatti tried to get rid of his external tanks but unfortunately one of his tanks failed to jettison. It was now practically impossible for him to close the gap between himself and his prey. So, he wisely decided to let the other pair of F-86s, led by Alam, tackle the Indian aircraft. Alam and his wingman started gradually to close in on the enemy. Thought I, in the F-104, would have had no problem getting into the firing range, I thought it appropriate and fair to let Alam try his hand first. I decided to keep the Hunters in sight and trail Alam, firstly to allow him more manoeuvring area and, secondly, to be ready for any one of them who might decide to run away faster. In the heart of my heart, I feared that Alam, with his complete mastery of the F-86 and his determination to punish each one of the Indians for the liberty they had taken, would give me no opportunity. In a short while I realised that my fears were turning into facts. Like me, Alam had also spotted only four Hunters. He decided to engage the one on the extreme right first. It was then that he spotted a fifth Hunter further to the right. He changed his mind and switched his attack to this new find. Barely a couple of seconds must have lapsed before Alam six guns were spitting fire and fury at this Hunter and I saw a ball of fire hit the ground. Alam pulled his guns on to the next Hunter. A few seconds later, another ball of fire hit the ground. Then the Indians tried a half-hearted defensive manoeuvre. Alam was almost overshooting an enemy aircraft but by then he had destroyed it - a third ball of fire and the pilot of this Hunter managed to eject from his aircraft before it crashed. Alam was once again in a better position to tackle the two remaining Hunters. It was only a matter of moments before these two also turned into balls of fire and crashed into the ground. I felt a pang of disappointment - Alam had been unfair to me. He had himself tackled them all, giving me no chance to bear my guns on to any one of them. The Indians disappointed me too. Had they just decided to run away from Alam, I would have possibly had a chance. I checked my distance from Sargodha; it was 37 miles. This was the first time that a fighter pilot had attacked and destroyed five enemy fighters at almost tree-top level in a short span of a minute or so. A new chapter was added not only to the history of the PAF, but also to that of military aviation. It was a great privilege to have been a witness to this encounter. The bit "Fox Hunt" started by the Indian Hunters had ended up in the "Fox" killing all the hounds but one. This one hound, I do not know how, managed to detach himself from the rest of the 'hounds' and ran back with his tail between his legs. I believe that on his return he was awarded a "Veer Chakra" for his demonstration of great courage and valour in the face of the enemy! I have been reading The Story of the Pakistan Air Force: A saga of Courage and Honour, a book of over 700 large-sized pages published by the Shaheen Foundation. Covering the development of the force from August, 1947, when it only had a few Tempest aircraft, the book takes the reader up to 1987 when F-16s were hurtling down the runways to go up in a breathtaking climb in deadly pursuit of their doomed quarry. But since this is the month of September in which we were forced into a war with India, it would be of interest to the readers if I quote some passages recounting the events of those fateful 17 days. "Everyone in the air defence chain had been alerted, and anxious eyes watched the ..... skies for the first hint of an enemy raid. This was why the half light before dawn on the morning of September 7 found Squadron Leader Alam and 5 other alert duty pilots already strapped in the cockpits of their Sabres and F-104s, ready to hit the start switches at the end of the runway, waiting for the signal to scramble as soon as warning of approaching IAF aircraft was received through the Pakistani radar .... network. "Although Sargodha already had its initial pre-dawn F-104 fighter patrol airborne, the first intimation of the arrival of the IAF was the sight of 6 Mystere fighter-bombers pulling up out of the sunrise from their tree-top approach to deliver their attack at about 0530 hours. Their navigation was good, and the great air base -- packed with aircraft, fuel bowsers and other rewarding targets -- lay sprawled beneath them ..... Strapped helplessly in their aircraft on the ground, the PAF Sabre and Starfighter pilots watched the Mysteres pull up to about 1000-1500ft, still maintaining tight and unwieldy echelon formation, and spray the empty tarmac area at random with their weapons ..... That they missed the 6 gleaming fighters on the ORP was a case of sheer panic as soon as the ack ack let loose a vicious barrage. They exited towards the south-west leaving Sargodha unscathed. They themselves, however, were less fortunate: one was shot down as it flashed past the anti-aircraft defences, while another fell to the 20mm cannon of the patrolling Starfighter." And now come the famous exploits of M M Alam: "Immediately after this first daylight attack, Alam and his No 2, Flying Officer Masood Akhtar, were scrambled with two other F-86s and an F-104, for an airfield patrol at about 15,000ft. Within about five minutes they were directed by ground control towards an incoming Indian raid ..... Squadron Leader Alam and his wingman started chasing the Hunters ..... Muhammad Mahmood Alam was a scrap of a man who appeared almost lost in the none-too-roomy cockpit of a Sabre. Yet during the 1965 conflict ..... this Pakistani squadron commander established a combat record which has few equals in the history of air warfare. Many pilots have scored several air victories in one sortie ..... but few are likely to be able to match his record of destroying at least three opponents -- Hunters of the Indian Air Force -- within the space of somewhere around 30-40 Seconds .... Accurate shooting is difficult enough at the best of times from a jet fighter travelling not far off the speed of sound. The problems of flying with such precision while in a turn of such crushing force that every part of you weighs more than five times its normal amount may be imagined. And yet throughout the short 1965 war, in which he claimed 9 enemy aircraft destroyed in only three encounters, Alam never had to fire more than twice at an opponent ...."
"..... after the first two hectic days of the war, there were only five occasions on which the .... F-86s of the PAF could goad the reluctant enemy into decisive air combat. The last of these was on September 20, and was unusual in that much of the ensuing dogfight took place in full view of delighted Lahorites, whose mounting excitement turned to exultation as they saw stricken Indian fighters plunge to their doom ..... The first pilot to get his sight on a target was Changezi, a scion of the Hazara tribe of the Balochistan province, who managed to turn inside his pair of Hunters despite the handicap of one underwing fuel tank ... (He) fired a short burst as the Hunter loomed up into his gunsight. Strikes were evident on the fuselage of the enemy aircraft, and after a second burst, it began emitting smoke ... It seemed the pilot was probably killed, since the Hunter suddenly levelled out from its violent turns and went into a shallow dive without much acceleration ...."
In that engagement, besides the Hunters, two IAF Gnats also joined in and managed to hit No 2 of the formation who had to bail out to touch the ground safely. However, the No 4, FLT Lt S N A Jilani managed to hit another Hunter. "As the Hunter plunged down in flames and went out of control, the remaining IAF aircraft broke off the engagement and disappeared." The book also gives a graphic account of the heroics of the PAF pilots in the eastern wing during the 1971 war when they were outnumbered ten to one. The book is well produced and deserves wider readership, specially by those who keep talking of strategy and tactics without knowing the difference between the meaning of the two words. I do not know whether the book is available in the market as the copy I have was presented to me recently by the Chief of the Air Staff. Its price has also not been quoted. It all happened very fast. We were all turning very tightly - in excess of 5g or just about on the limits of the Sabre's very accurate A-4 radar ranging gun-sight. And I think before we had completed more than about 270Ãƒâ€šÃ‚Âº of the turn, at around 12Ãƒâ€šÃ‚Âº per second, all four Hunters had been shot down. In each case, I got the pipper of my sight around the canopy of the Hunter for virtually a full deflection shot. Almost all our shooting throughout the war was at very high angles off - seldom less than about 30Ãƒâ€šÃ‚Âº. Unlike some of the Korean combat films I had seen, nobody in our war was shot down flying straight and level. "...The PAF later obtained the personal details of at least three IAF Mystere pilots who were killed in air combat over Pakistan on 7 September. From their ranks ÃƒÂ¢Ã¢â€šÂ¬Ã¢â‚¬Å“ two were Squadron Leaders (Jasbeer Singh and A.B. Devayya) and one a Flight Lieutenant (B Guha) ÃƒÂ¢Ã¢â€šÂ¬Ã¢â‚¬Å“ all were evidently officers of considerable experienceÃƒÂ¢Ã¢â€šÂ¬Ã‚Â¦.even if they had been junior personnel, a 50% mission loss rate could not be long endured by the IAF, or any other airforce for that matter." S/L Alam clearly states that he saw four Hunters attacking the airfield and another two 1000 feet to his rear. He then claims that he forgot about the other four and engaged the pair behind him. However Iqbal states that S/L Alam spotted only a fifth Hunter in addition to the earlier four. Or did Iqbal mistake two Hunters for one? In fact, Iqbal goes a step further and states the fifth Hunter S/L Alam spotted was to the right of the four-ship Hunter formation. Quite a contrast to S/L Alam's claim of seeing two Hunters a 1000 ft. to his rear! S/L Alam also states that he used GAR-8 Sidewinders instead of his guns, when he attacked the two aircraft. According to Iqbal however, S/L Alam used only his guns and does not mention Alam using his Sidewinders. If Iqbal is referring to the second encounter, again discrepancies arise from his story. S/L Alam claims to have seen five IAF Hunters in immaculate battle formation and once he entered gunfire range, the IAF Hunters called a break. Iqbal however states that only after two Hunters were destroyed, did the remaining Hunters in the formation call the break. Obviously both versions are contradictory to each other, because it is very easy to determine three aircraft from five - especially when they are in the air. The third Hunter in the formation, according to Iqbal, also became a victim of S/L Alam's guns but the pilot managed to eject before the aircraft crashed. S/L Alam states exactly the opposite of Iqbal and says, "None of these four pilots ejected, and all of them were killed." S/L Alam had in fact claimed the pilot who ejected as his first kill. Iqbal concludes the air battle by saying that S/L Alam destroyed the remaining two Hunters in the formation, thus bringing his total kill rate in that sortie to five aircraft. S/L Alam also concurs with that figure. It appears that that is the only thing S/L Alam and Iqbal agree on, because everything else in Iqbal's story is remarkably different from S/L Alam's version. Iqbal proudly claims to have been an eyewitness to the S/L Alam encounter. The impression left is that of a deliberate attempt by Iqbal to support S/L Alam's tally. Fricker tries to build some ground behind the claim of S/L AlamÃƒÂ¢Ã¢â€šÂ¬Ã¢â€žÂ¢s Hunter by referring to the IAF's list of casualties. Fricker states that the PAF has record of at least five IAF Hunter pilots who were killed on unspecified dates and circumstances. This was collated at the end of the war when the IAF released a list of officers killed in operations. The list contained the names of only those pilots who were killed over Indian territory. The IAF did not give any details on the dates and circumstances of how some of these officers were killed or from which unit they belonged to. The PAF identified certain names as those of Hunter pilots. The names of S/L A.K. Rawlley, F/O F.D. Bunsha, F/L T.K. Chaudhari and F/O G.S. Ahuja stood out prominently as they were known to be Hunter pilots. Though Fricker does not state this explicitly, he implies that among these five names are names of S/L Alam's victims as well as other victims of the air combat over Halwara in which the PAF claimed five Hunters shot down and destroyed. Fricker would hardly know, nor did many Indians for that matter, the circumstances of the deaths of the above pilots. Only in the 1990s did details of how some of the pilots who were killed emerged. None of them could be attributed to the kills of S/L Alam, either over Halwara (India) or over Sargodha (Pakistan).